Three friends on a road trip learn that strangers seen through their video camera soon die under mysterious circumstances. Richard Harrison and his girlfriend Eva Hansen pick up their friend Simon Lacey for a road trip to a mutual friend’s wedding. Simon records the entire weekend on his video camera. While Rich and Simon load the car, Eva goes inside to speak with Simon’s girlfriend Laura ‘L.T.’ Taylor. Eva appears distraught when she comes back outside. Throughout the trip, Simon repeatedly records Eva, indicating feelings for her that she recognizes. Rich hits a coyote while driving, upsetting Eva when they collectively agree there is nothing they can do and must leave the dead animal. While checking into their first motel, Simon sees that the face of the motel clerk is distorted through his camera lens. That night, the clerk is shot dead. The next day, Rich sees the distortion on the faces of every tourist looking at a deer outside their tour bus. A car hits and kills the deer. That evening, there is a brief moment when Eva returns Simon’s affection. Simon is unable to reach his girlfriend by telephone. Through the camera, the ghost of the motel clerk appears suddenly in the new hotel room, but only Simon sees it. The trio stops at a convenience store. Simon sees a newspaper report about a bus crash that claimed 22 lives. He realizes that it is the same bus #069 that he saw with his camera the previous day. Simon sees the distortion on the face of the convenience store clerk. Later, a police officer pulls over their car and takes the three friends in for questioning. Simon sees the distortion on the officer’s face. The trio learns that shortly after they left the store, it burned to the ground and the clerk died. After they leave the interrogation room and are released, the officer is mysteriously shot in the head. Back on the road, Simon tells Rich and Eva his theory about the camera showing him people who are about to die. Simon sees the store clerk’s ghost running alongside the car. The ongoing situation causes more arguments amongst the group. Simon has a private conversation with Eva. She theorizes that she and Rich are unaffected because the camera kills only strangers and not anyone that Simon cares about. An argument ensues over Simon continuing to record even when he believes it is capable of killing people. Eva refuses to be recorded. The trio stops at an abandoned gas station. Simon sees the ghost of his girlfriend Laura coming toward the camera with slit wrists. Rich pleads for Simon to give him the camera while Eva walks around the station’s exterior. Simon sees Eva’s distorted face through the lens, but he is unable to find her when he gets out of the car. Rich confronts Simon about his feelings for Eva. Simon ends up beating Rich to death with the camera. Eva is nowhere to be found. Simon reviews the footage he shot before leaving for the road trip. An argument between he and his girlfriend is shown in which Laura breaks up with Simon over his feelings for Eva. She angrily storms out of the room and Simon wipes the camera lens, indicating that he saw distortion on her face. He freeze frames on his own reflection in the mirror. Because the distortion only appears in real time and not when recorded footage is viewed later, Simon is uncertain if the camera foretold his death or not. Poke around the Internet for opinions on “Skew” and the adjectives will range from brilliant, deep, and thought provoking to slow, pointless, and not frightening. As is often the case in such matters, the truth of the film’s value dwells somewhere in between the two camps. 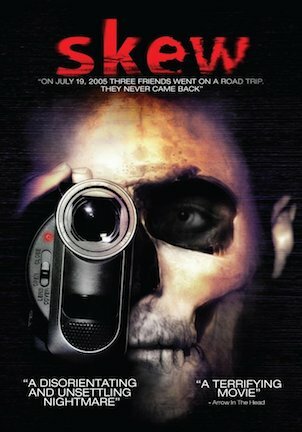 Fans of the movie along with its writer/director Sevé Schelenz balk at the classification, yet for purposes of avoiding a semantics debate, “Skew” can be deemed “found footage” horror. The footage may not have been lost to begin with, and the movie purposefully uses techniques like rewinding tape in real time, but the sub-genre term as it is popularly understood still applies. Simon is this film’s version of the person unable to stop filming home movies to the point of being a constant nuisance. Leaving behind his girlfriend Laura to deal with a later-to-be-revealed yet obvious-from-the-get-go relationship dilemma, Simon joins best friend Rich and Rich’s girlfriend Eva for a weekend road trip to another friend’s wedding. With the way Simon’s camera lens is unavoidably magnetized in Eva’s direction, and the knowing glances she occasionally shoots back, the source of strain amongst this group is immediately apparent. These moments of suppressed suspicion and ignored emotions are just the first inkling that everyone is in for an uncomfortable car ride. Blurred faces seen through Simon’s camera are at first presumed to be smudges one wipe away from resuming pristine clarity. Until the bodies those blurs belong to start turning into corpses. Their relationships already on shaky ground, the three friends now become embroiled in a supernatural mystery that threatens their lives. The common audience complaint of “why don’t they put the camera down?” is as old as the sub-genre itself. And “Skew” is definitively the mother of all “why do they keep shooting?” “found footage” movies. It is simultaneously a boon and a detriment that the use of a camcorder is a central part of the story. The boon is that the camera is a character of its own and not simply a tool capturing onscreen action. The detriment is that sustaining this conceit detracts from the plausibility of the movie’s latter half. Simon puts together that his camera is involved in either causing or predicting imminent death after a busload of tourists dies violently. Just to be sure, he performs an additional experiment on a random person anyway. When that poor soul ends up charred, Simon can be fully certain that he has some sort of death machine in his hands. The camera does not have to be totally destroyed at this point, but at least putting it away might be a wise course of action. Not only does Simon refuse to turn off the power, he continues filming his best friend and the woman he is in love with, even knowing that killing them could be a side effect of his purposeless home movie. “Skew” traps itself in other sub-genre tropes, too. Added music cues spike the tension here and there, at the expense of giving the POV reality an awareness of being artificial. The soundtrack also leans heavily on a painfully shrill noise that sounds like an annoying hearing test signal. And patience must be primed to make it through several lengthy scenes of intentionally off kilter shots including a glass of orange juice on a breakfast table and blurry nothingness during an emotional conversation. Despite such drawbacks, “Skew” musters appeal by fostering curiosity for its mystery. The logic motivating the characters and the occasional flatness of the tempo can be aggravating. Offering balance are sincere performances from unfamiliar faces and an intention to be strangely unsettling versus favoring phony jump scares. Amber Lewis in particular has moments of subtlety where a playful smile melts into an almost imperceptible frown and highlights her character’s inner conflict. “Skew” has flashes that work in the face of an overall arc that never completely catches fire. Some online remarks directed at “Skew” attribute ideas it never actually had. The slightly ambiguous ending has been misinterpreted with scenarios including the camera never existing, Simon and Rich being the same person, and a flesh and blood explanation for the ongoing murders. These enthusiastic theorists read more into the movie than the director intended. The full story can be found elsewhere, but Sevé Schelenz has confirmed that the final shot does include a camera. It just cannot be seen from that angle. The story of “Skew” is not as complicated as some would make it out to be. Still, if a movie can inspire any spirited debate at all, that shows it is doing something right to affect its viewers and to engage their minds. “Skew” automatically earns some leniency for trying something with “found footage” that does not revolve around a singular ghost or a haunted building. Flawed, imperfect, and at times irritating, “Skew” is a movie that gives more thought than most to its narrative, even if the cohesiveness can be considered tenuous. November 24, 2013 by Ian Sedensky.